History: Chesapeakes were originally bred on the eastern seaboard of the United States for the commercial duck hunting trade. They were bred to be rugged and hardy to endure the harsh elements while retrieving hundreds of birds per day during migration periods. 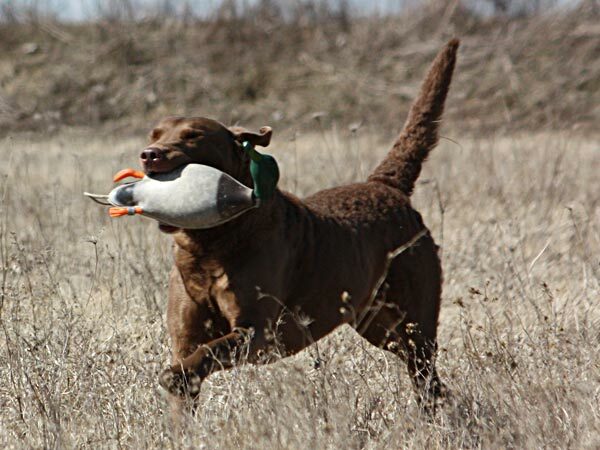 They were bred to work with little direction from their handler – once they understood their job they went about it diligently and used their keen senses and good judgement to get the job done. Coat: Short, wavy, double-coat. Oily and water-resistant similar to a duck’s feathers. Colour: All shades of brown from deadgrass (blonde) to deep brown (chocolate). Can be solid or varied. Can have white on toes, chest or feet. 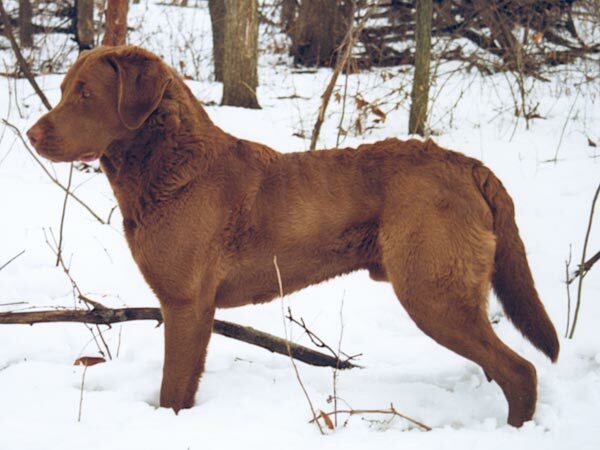 All colours work with the natural environment to camouflage the dog in hunting situations. Shedding: Heavy shedding occurs once or twice per year. Grooming: Bathe only when necessary with mild soap so as not to strip the oil from the coat. Training: Consistent, firm, fair training is not optional. Early and continuous exposure to new environments, people and situations is needed. 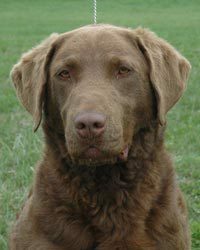 The Chesapeake is a highly intelligent dog that is prized for their ability to think for themselves. Training programs must be adapted to the dog and not the reverse. Exercise: Moderate – younger dogs need more. Swimming is their favourite activity. Temperament: Extremely loyal to their family often showing particular fondness for one member. Can be aloof with strangers. Protective of their people and property. There are more than a few well-documented cases of toddlers being rescued from drowning by these tenacious, faithful creatures.